Welcome the 'packs a punch' part of the Valparaiso family, the motorcycle gloves! Combined with the matching jacket and trousers you'll have a set that will keep you touring in comfort and style! 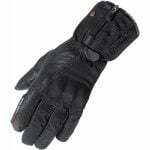 These motorcycle gloves use McFit technology to offer you a waterproof, breathable and comfortable motorcycle glove. The McFit technology incorporates a Drystar membrane (offering the waterproofing and breathability) in to a thin layer of fabric for maximum feel of the handlebars and less bunching and bulkiness. These Alpinestars textile combo gloves also offer plenty of protection, should you ever need it. PU knuckle armour covered in leather offers abrasion resistance whilst reflective detailing helps improve your visibility. A Dual Velcro wrist fastener ensures a comfortable, but most importantly, safe fit. The palm is leather in the event of a slide and there is EVA foam padding at essential places. You've also got a visor wiper, which adds to your safety as you wipe away the rain and improve your field of vision. The neatest feature of these motorcycle gloves can really make a difference in the event of a crash. Alpinestars have patented a finger-bridge between the little finger and ring finger. This means that in the event of a slide, the two fingers do not become separated and are at less risk from twisting and dare we say breaking. GetGeared absolutely love these motorcycle gloves combined with the matching jacket and trousers and we're sure you will too! "This is my second pair of Valparaiso gloves. Overall, great for most conditions, especially the rain. Cold weather (5 degrees and below) I tend to use inner gloves, heated grips and, if needs be, muffs too.Good points:- Fit well- Are waterproof- Good for 10 degree weather (colder needs something warmer)- Offer good protection- Wear in nicely so that they're incredibly comfyBad points- If the latex-type glove inside breaks, then there goes your waterproofing- Finger ends lasted two years on my first set before tearing- Very stiff when new- Clamping collar / strap is fiddly at times"